This is a listing for the 1993 Ertl - American Muscle - Budweiser T-Bird #11 Bill Elliott - 1:18 Scale Die-Cast Car pictured. This item is Brand New in the Box/Packaging. We offer FREE SHIPPING on this Sprint Car via FedEx to all Continental 48 states addresses. If you live in HI, AK or APO/AE, please contact us so that we can determine if we are able to offer free shipping to your address. International shipping is available via the eBay Global Shipping Program. Thanks for looking! Please check out my other items! 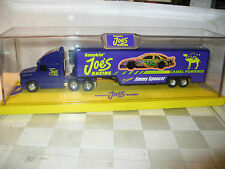 # 1/64 scale Transporter.Smokin Joes Racing. and ck back weekly YA! NEVER KNOW Whats NEXT. THE CAR IS MINT IN UNSEALED BOX ,THE BOX DOES SHOW WEAR/EDGE WEAR WITH CREASES. THE PLASTIC WINDOW IS YELLOWED AND DOES HAVE SCRATCHES WITH SMALL MINOR CREASES. THIS WOULD BE A GREAT ADDITION TO YOUR COLLECTION! THE CAR IS MINT IN UNSEALED BOX ,THE BOX DOES SHOW WEAR/EDGE WEAR WITH CREASES. THE PLASTIC WINDOW DOES HAVE SCRATCHES WITH CREASES WITH A TINY HOLE WHERE THAT BIGGER CREASE IS. THIS WOULD BE A GREAT ADDITION TO YOUR COLLECTION!